Barbie fans don't be without this Barbie 3 Story Dream House. If there’s anything that girls consider fierce, fun and fabulous, it’s Barbie. Let your little girl’s imagination soar to new heights as she spends hours and hours of countless fun with Barbie and her friends in Barbie’s 3 Story Dream House. The three-foot tall dollhouse comes fully furnished with realistic lights and sounds that sure to make your little girl’s face light up with wonder and excitement. 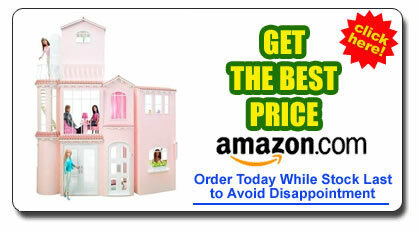 Various Barbie dollhouses have long invaded and conquered the market. But the latest Barbie Dream House will surely provide little girls with the best excuse for playing house – the luxurious, pink three story home opens up to a grand, winding staircase leading to rooms promising the ultimate in entertainment, with realistic sounds that give pretending a new meaning. Hear the doorbell chime as Barbie’s friends announce their arrival. Ever had a dolls house where the toilet makes a flushing noise ? Hear the “sizzling” sound of a perfect meal that Barbie has cooked on her state of the art kitchen. Relax while listening to the 2 songs that will play over the house intercom as Barbie finishes dressing up in her posh bedroom complete with a Murphy bed on the third level. Listen as the toilet “flushes” and the lights turn on. Help Barbie as she takes her friends on a tour of her dream house complete with balcony overlooking a great view. With more than 70 pieces that can be arranged and re-arranged, the third level part of the house can also be removed so your child can take it as a mini-playhouse anywhere she goes. Little details add a very realistic touch to the Barbie Dream House like a rubber duck toy for the bath, a laundry basket, little flowers and railings for the balcony among others. What’s more, the dollhouse closes and folds up for easy transport so little girls will have no problem cleaning up after themselves when playtime is over. All that’s required is three double “AA” and two triple “AAA” batteries and an adult to assemble the Barbie Dream House. Aimed for 4 to 10 year olds, remember to keep small children away while the dollhouse is being assembled, as there are small parts that may be choking hazards. In addition, it is also recommended that all the doors and windows of the dollhouse be securely placed in their slots as they have a tendency to fall off with constant playing.